Switzerland is a small country in Central Europe, and it is mostly known for its magnificent mountains. The Swiss Alps are located in the south, while the Jura Mountains are in the northwest. The country is widely known in Europe as one of the best places to go and ski, but you may have heard about it for the precision and quality of its watches. While there are other attractions in Switzerland, we recommend going trekking via Alpina Green Trail. In seven days, you must climb 144 km. It is exhausting, but you will see the most unbelievable views over the Alps. Plus, on your way, you will stop at luxury resorts, enjoy haute cuisine, and relax in their spas. And it is not even that expensive. One of the things that you need to remember before your departure to Switzerland is that you may need a visa. Since Switzerland is the in the Schengen Area, you may require a Schengen visa. That is not applicable in two particular situations. You do not need a visa if you travel from another EU state or an EEA (European Economic Area) country. EU and EEA citizens have the right of free movement within the Union. A visa-exemption is also given to people who travel from the countries that are in the visa waiver program (Annex II). However, this category of travelers can stay within the Schengen Area for up to 90 days. To find out if you are in one of those two categories, you can take a look at the visa policy of the Schengen Area. However, we have a better idea, and that is to use the Visa Checker from iVisa. All you have to do is access it, select your nationality from the drag-down menu on the left, and choose Switzerland as your destination. The result will let you know what you need. Moreover, if you do require a visa, you will be given a list of the nearest embassies where you can apply. 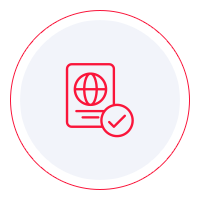 You cannot obtain a Schengen visa online, which is why iVisa does not process online applications. Even so, we would still like to help you somehow. Our support service is at your disposal should you have questions about the visa application process. It is available 24/7, and it is free of charge. Once you find out that you do need a Schengen visa to visit Switzerland, you need to decide to which embassy you must go. That is because you do not have to go to the Swiss embassy. Not necessarily. It depends on your travel itinerary. The rules about this are quite strict, and they go as follows. If you want to travel to Switzerland only, then, of course, you must get your visa from the Swiss embassy. However, if you have multiple destinations in the Schengen Area, you must go and apply for your visa at the embassy of the country which is your primary destination. Lastly, if that cannot be determined, you must pay a visit to the embassy of the country that you visit first. While we cannot help you with the Schengen visa application process itself, we hope that the information above helps you go in the right direction.